Successfully Added Android Phone Xiaomi Redmi 4X - 5 Inch HD Display, Dual-IMEI, 4G, Snapdragon 435 CPU, 3GB RAM, Fingerprint, 13MP Camera (Black) to your Shopping Cart. With the Xiaomi Redmi 4X Android phone at your side, you’ll be able to enjoy an exceptional mobile user experience at an affordable price. This Android smartphone comes packed with an Octa-Core Snapdragon processor that has been clocked at 1.4GHz. Capable of dealing with the latest and most demanding software features, this piece of hardware lets you enjoy all the features this mobile phone has to offer to its absolute most. Additionally, the Android phone comes with 3GB RAM – making it perfect for multitasking purposes. Whether you’re into mobile gaming, watching movies, or simply like to stay in touch with friends and family online – this 5-Inch smartphone will meet all your demands. Running on the MIUI 8 interface which has been based on Android 6.0, this mobile phone treats you not only with the latest Android features but also with an abundance of its own add-ons and customization features. 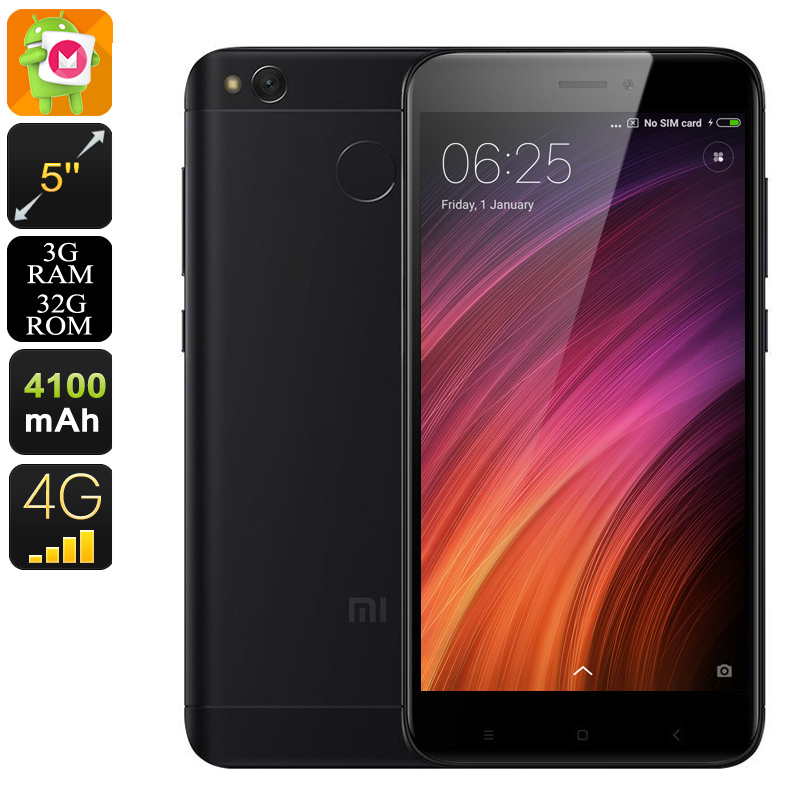 Supporting two SIM card slots and Dual-IMEI numbers, the Xiaomi Redmi 4X Android phone brings along great connectivity. 4G support further increases your connectivity by treating you with the fastest mobile data speeds out there. No matter where you’ll be at – you’ll always be able to download files, stream movies, and browse the web at lightning speeds. Its powerful 4100mah battery allows you to stay connected throughout the day and enjoy numerous hours of non-stop mobile entertainment without needing to worry about the status of your battery life. At the rear of this sleek and stylish designed Android smartphone, you’ll be able to find a state of the art fingerprint scanner. With the simple touch of your finger, you’ll be able to unlock your phone and access all your files and media. Additionally, the rear of this Android phone also features a professional-grade 13MP camera for all the smartphone photography lovers among us. Snap breathtaking images and shoot Full-HD video – from now on you’ll have all the means necessary to make sure not a single special moment in life will ever again pass by uncaptured. With 32GB internal storage and 128GB external memory support, this Android phone holds plenty of space to store all your Applications along with your pictures, video, and other media. This Android Smartphone comes with a 12 months warranty, brought to you by the leader in electronic devices as well as wholesale electronic gadgets..